The ideal guide for people who are currently well into their QS career but want to take it to the next level. 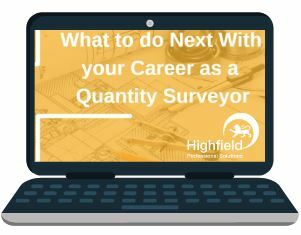 The role of a Quantity Surveyor is developing to keep up with the changing market. Wondering what you could do to keep up? You might be in a job that is currently serving you well or perhaps you want more opportunities going forward. Whatever it might be, this guide will help you find a way to create a new path for your QS career that meets your expectations, aspirations and life goals. A clear understating on how you could better your career by becoming RICS qualified. The options to change sectors with your current skills and experience. A guide on the different roles you could choose from. Download it now to get some serious advice on what to do next with your QS career.